Media Credit: Photo by flickr user Fuzzy Gerdes used under a CC BY 2.0 license. 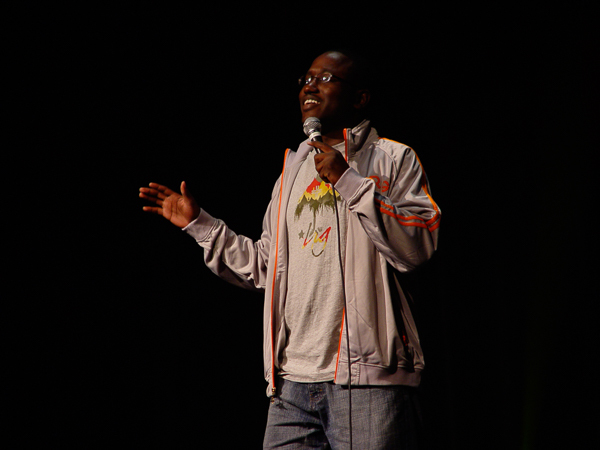 Comedian Hannibal Buress will return to the District to perform back-to-back shows at the Lincoln Theatre on Oct. 17. Stand-up comedian Hannibal Buress is coming off a round of shows that were part of Funny or Die’s “Oddball Comedy and Curiosity Festival,” which also featured Aziz Ansari, Amy Schumer and Louis C.K. this year. Now embarking on his own nationwide “Comedy Camisado Tour,” he’s preparing for back-to-back shows at the Lincoln Theatre on Oct. 17. We caught up with him to talk about the joke-writing process, riding Amtrak trains and texting during shows. The interview has been edited for length. You were just in D.C. on Sept. 27, when you opened for Aziz Ansari at the Verizon Center. What have you been up to since then? Hannibal Buress: I went back to New York for a little while and then I had some gigs in Indianapolis and San Fran, so I’m still out in San Francisco now, just living life. Doing shows, writing jokes, hanging out, eating food. I wanted to bring up one of my favorite jokes that you made before Aziz Ansari’s set, about how Amtrak doesn’t search your bags before letting you board the train. How do you take a personal experience like that and broaden it for a wider audience? HB: Well, it’s based on personal experience, but a lot of people take Amtrak, so I just found it interesting that they don’t search anything. But I guess that if they did search it wouldn’t be as efficient, you wouldn’t be able to get on the train as fast. I guess that’s the thought behind it. So it’s just me thinking about things … and some comedy is specifically for me, but some of it is the basic stuff, you know like I was at a restaurant, or you know I just try to make it relatable in any way. When you come to D.C., you have an early show and a late show. Do you prefer one crowd over the other? Are there noticeable differences between the two? HB: It’s different energy a little bit. We added the late show because the early show kind of sold out, but I think the big difference is that the early show – it’s on a Friday – so with the first show you get a lot of people coming from work, so they might be a little bit rushed, but they still are psyched because they are the ones that bought tickets right away or sold that show out. The second show people will be, you know, they probably went to dinner, had a couple of drinks before the show, had some time to relax, so they’ll be a bit looser. The later show is a little younger, usually. You’ve recently become pretty popular on the show “Broad City.” Do you prefer the TV stuff or do you prefer the touring and the stand-up side? HB: I prefer stand up just because it’s mine and it’s stuff that I wrote. Acting is fun but it’s just a different thing. Also, stand up is easier, like if I think of a joke today I can try it out later today but acting – you can put stuff online, but it’s just a different process than making stand up. When you come up with new jokes, do you test them out on audiences on tour or do you tell them to people close to you first to see how they go over? What’s that process like? HB: I’ve got a couple of friends that I’ll run material by and see how it goes or I’ll try in front of a crowd. I won’t make it obvious like “This is a new joke.” I’ll try to do it casually and see how it goes. Sometimes you’re doing a joke and it crushes the first time, which is a good feeling, and sometimes it doesn’t work out and sometimes it does OK. You gotta figure out what needs to be added. With any of those, it’s just fun to work it out, but I try to make sure when I’m touring to make sure the show is really solid so its not too much brand new material but I’ll try a couple of things. What’s your take on audience interaction? Do you call people out when they’re talking or texting? HB: If somebody’s texting in the front row, definitely, because that’s real distracting and disrespectful if you’re right there. If I’m doing something like that at a show, you try to be at the back or step out. But, yeah, if you’re in the front row texting, I’ll definitely say “Hey, what is wrong with you?” I understand the need to want to text, but I don’t do it in the front row of a show. I usually don’t just go after an audience member that’s doing nothing. Sometimes I will. It is fun to do that and riff with the crowd and just see what happens and shift up the energy a little bit.